June 15 - Monday - Yesterday and today have been free from rain and very pleasant. We have attended the Literary meeting this evening and the paper was interesting--very. Martha Phelps, Ed. and Chapin Tracy, Assistant; neither one had ever read the Luminary before; they did well. Broke our carriage, so we came back on foot. Mary Andrus came with us. June 16 - Commenced raining again last night and has been showery through the day, bidding fair for a wet night. Mary and I spent the day at Uncle Orra's, he is lying very low--not able to sit up but a few minutes at a time. We called at Mr. Ziba Gerould, Uncle Buckley's and Lewis Gerould. Received a good letter from Fannie Baily, the first she has written me. June 17 - Pleasant part of the day but began to rain hard about 6 P.M. J.W. Phelps dined with us. Mary went to the shop this afternoon. Don went for a load of goods for Phelps at Waverly. Father sold 9 two year olds to a Grover for $225. June 18 - Thursday. Rains more or less about every day. Uncle Orra fails very fast--cannot live long. Received a letter from Mary Ellen telling me to meet her at Waverly on Tuesday next--aren't we glad? June 19 - Dr. and Mrs. Andrus here this afternoon. June 20 - Saturday. A very hard shower just at night, but we have very little thunder. June 21 - Sunday. Some cold and some hot, hardly know which predominates, guess the cold though. Mr. Corss texts were Matthew 19, 16 to 22 and Rom. 12, 4 and 5. Went to the South Sunday School. This evening Lark brought Mr. Rathbone and his daughter here to spend a day or so. June 22 - Rained all the afternoon and is raining now. Mr. Rathbone and daughter have gone to Uncle Bulkleys. Mary Andrus is here and we are going in the morning for Mary Ellen. June 23 - Selden, Mary Jerusha and myself started for Waverly about 7 o'clock this morning. Mary Ellen came on the 3 o'clock train. She left Sherburne yesterday afternoon, stayed in Norwich overnight. Libbie came down and stayed with her. We got home a little before nine this evening. She has been absent rather over three months. June 24 - Mary Ellen and I have called at Uncle Orras and Bulkleys. Lark here this evening. June 25 - Have a few days of pleasant weather. Dr. Tracy and Lady, Ann and Elmer here to dinner. Uncle Olmstead, Aunt Anna, Nehemiah, Amy and George to tea. June 26 - Uncle Selden and Jane called in. Uncle Orra no better. June 27 - Mother gone to stay over Sunday with Uncle Orra. Henry Phelps called on his way to Burlington to school. John and Lizzie Phelps made a long call this afternoon. June 28 - Sunday night. Rained again last night, but cleared off this morning and has been the warmest day of the season. Mr. Corss texts were 1 Timothy 6, 9, 10, 11, and Proverbs 14, 25. Attended the South Sunday School. Have an interesting class there of young girls. June 29 - Rained again last night and mostly through the day. Johnny Bird here to dinner. June 30 - Pleasant a while this morning, but soon began to rain and has poured down hard ever since. Sallie and Lois Tracy called a while. July 1 - Wednesday. Rained again, but not so much as every day before this week. Selden, Mary Ellen, Rush and I went calling this afternoon and evening. Took tea at Mr. Birds, called at Mr. Corss and John Phelp's. Mary Andrus came home with us. We found Uncle Orra was much lower, perhaps will not survive through the night. Father, Mother and Aunt Sallie have gone to stay overnight. Rains. July 2 - Uncle Orra still living, but evidently near his end. Mr. Higgins here, Samuel Miner and Horace Niles called in this evening. J. W. Phelps is going to prepare a dinner for a small party on the Fourth. We shall go if Uncle Orra is no worse. July 3 - Aunt Sallie went out early this morning to see Uncle Orra, found him dying and sent Helen here for Father and Mother, but he died before they reached there, between 8 and 9 o'clock. His end was peace and joy. The last words he addressed to anyone, in particular, were "Praise the Lord Praise Him as long as you live" and directed to Uncle Bulkley, about an hour before his death. After this he would break forth in prayer and ejaculations of praise. The funeral services take place on Sunday at 1 o'clock P.M. in the Baptist Church. Mary Andrus is here to assist us in making preparations. Dr. Bullock and wife, Hiram and Harriet called this evening. July 4 - Been to Uncle Orra's, but is Uncle Orra's no longer. How can we stop calling it so? The corpse looks very unnatural. How lonely it will be there now! Lark and Selden sit up there tonight. Hasn't rained for two days at least. July 5 - Sunday night. Lark and Mary Andrus have stayed here all day and had supper ready when we got home. Mr. Corss preached excellent. Text Psalm 92, 14 "They shall still bring forth fruit in old age". The remains were buried before service. Then, as it was Communion day with us we repaired to our church and the Sacrament was administered under these peculiar circumstances--being the first time Uncle Orra was ever absent from the Communion table during the time of his being a church member which is 45 years. His age was 63 years the 25 of last November. Lo we have come home tonight and left Uncle Orra sleeping in the church yard. Nine weeks today he went to church and came back and the next Thursday evening he was here to the Prayer meeting and that is the last time he was from home. Oh, how we shall miss him! July 6 - Rained a little; hard showers off to the North and East. Dr. Tracy and wife, Uncle Selden, Aunt Susan and Bittie here to dinner. Heard the Luminary read by Laura Bird and Nancy Niles. July 7 Tuesday. We children and Mary Andrus received an invitation from John and Lizzie to spend this afternoon there, which we did all, but Don, as we could not attend the party there on the 4th, except Don and Rush went and took dinner. We had a pleasant time and came home in the evening after the thunder shower. July 8 - Charlie Corss, Charlie Gladding and Susan Phelps were here to dinner. Mary Andrus and Cornelia Califf here to stay overnight. Pleasant and warm. July 9 - Mr. Higgins called to bid us "Good-bye"; has started for Conn. with his own horse and carriage. Still warm and no rain. Mrs. Hulburt died yesterday. July 10 - Father and Mother went to the funeral. Mrs. Henrick and the children came in to town today. ?. N. Allen came in on Wednesday with his Lady-just married. Lemon here tonight. July 11 - Mrs. Christopher Child gave us a call. Selden gone to Mr. Birds to stay tonight. July 12 - Sunday eve. This has been a tremendous hot day. Attended church. Mr. Corss texts were Nehemiah 5, 7 and Jeremiah 2, 11. Horace Niles came home with us and went down to Sunday School. He and Lark spent the evening here. July 13 - Very warm. Showers around us but none here. July 14 - Mariette Mitchell spent the day with us. July 15 - Harrison Mitchell, wife and little boy here this afternoon. Mary Ellen gone to Mr. Birds to sew for Laura. Received a letter from Sarah Huston. Warm and no indications of rain. Our folks commenced haying. July 16 - Very warm--no rain. July 17 - The Children's Missionary Society met at the Church to pack a box of clothing to be sent to some Missionary station. July 18 - Saturday. Intensely warm; showers around no. Maria Child took dinner with us. Caroline called here. July 19 Sunday. Another very warm day. Showery towards night, but little rain fell in this immediate vicinity. Heard Mr. Corss preach from Haggai 2, 6, 7, 8 and 9 verses and Isaiah 53, 11. Mary Andrus came from Church with us and stayed till evening. Rush taken sick and had to leave meeting. July 20 - Two years since our family festival. Mrs. Henrick here to stay overnight. George Allen died this day in Iowa. A nice shower accompanied with hail. Lemon came to work for us this morning. July 21 - Pleasant until noon when it clouded up and we had a fine shower. Mrs. Hendrick, Mary Ellen, Don and I spent the afternoon at Dr. Andrus. July 22 - Don and Rush been to Waverly. Four of Mr. Niles children called this evening. Not a good hay day. Caroline here to dinner. July 23 - Mr. Foster--Presbyterian Minister of Towanda--here to prayer meeting this evening. Charlie Corss and Polly Tracy stay overnight. July 24 - Don, Charlie and Chapin went on a visit to Mr. Allen Califf. Had an application for teaching school South of our district. July 25 - Saturday. Mr. Marshall here nearly all day. John, Lizzie and the baby called. Harriet Carpenter here to tea. July 26 - Sunday night. A very warm day. Heard Mr. Corss preach this morning from Luke 19 first clause of 22 verse. Mr. Hendrick preached for us in the P.M. from Proverbs 13, 22. He has not been in Smithfield since a year last May--at the time he was married. Dr. Bullock and wife called a few minutes ago, also John Phelps, and I am going home with him. July 27 - Rush came for me early this morning, and we went to pick raspberries, as soon as we got home. Looked very much like rain this morning, but has been a nice hay day. July 28 - Charlie Martin and Jane Tracy came and brought cloth for six fine shirts to be made, if possible this week. Rained again towards night. Fred Corss here. July 29 - Aunt Susan, Charlie and Bittie here to dinner. A very cool, comfortable day. Have finished reading and hearing read "Pluri-bus-tah", a take off, on Hiawatha. July 30 - Mary Andrus here. Emir and Chapin called. Paid Emir $100 of the five I borrowed of him. Very rainy. July 31 - We girls have been very busy sewing. Mary Andrus making Selden a white vest. Aug. 1 - Quite warm--fine hay day. Mrs. Crowell came and brought Johnny Crowell here this afternoon and he will stay over Sunday. He arrived in town from Cleveland, Ohio last Saturday. He is son of John Crowell, the ex-congressman, was 17 years old, the third of March last. Aug. 2 - Sunday. Mr. Corss texts were Psalms 112, 4. A funeral discourse was preached at the Baptist church for George Allen. Johnny went down to Sunday School with us. Johnny Bird and Martha Phelps called this evening. Aug. 3 - Dorrance and Johnny have been making calls. Got back a little after noon. We attended the Literary Meeting this evening. Miss Betsey K. Lyman and Clinton Wood read a very good paper. Aug. 4 - This afternoon Don, Mary Ellen and I went and took Johnny back to Mr. Crowells. He will come here again Thursday. Rush commenced school down South--her first attempt at teaching. Aug. 5 - Rained last night and has been rather cool and cloudy through the day. Am reading a book of Johnnys--Charles James Anderson's travels in South Africa--in the years 50-51-52-53--very interesting. Aug. 6 - Thursday--Johnny came back this afternoon and will stay over Sunday. Rush came home, likes her school. Aug. 7 - Weather getting to be very warm again. Mary Ellen, John and I took dinner at Uncle Bulkleys, then we all--a whole carriage load--went out to Oak Hill to see them burn a ten acre fallow, as John never saw anything of the kind at the West. Came back to Alanson's and spent the evening there. Don and Rush came for us. It is the first time I've been there since Uncle Orra's death. How vacant his place seems! Aug. 8 - Very warm. No rain since Tuesday night. I am almost sick and quite blue. Chapin stays here tonight. Aug. 9 - Sunday. Mr. Corss preached in Towanda and we were without a minister. Felt too tired and sick to attend the South Sunday School. Mary Ellen, Rush, John and I took our books and went up and sat under the apple trees and read. Aug. 10 - Mother has been to Uncle Gorhams all day cooking for the men who are assisting in moving the old house. John and I went and carried Rush to her school and went round by the Centre home. Began to rain in the forenoon and has kept it up most of the time. Aug. 11 - Aunt Sally and Johnny went for Rush and then to Mr. Crowells. Johnny, Mary and I are going to Canton on Thursday and coming back Saturday--if nothing prevents. Aug. 16 - Sunday night. Last Wednesday night Don carried us over to Mr. Crowells and next morning Mr. Crowell took us to Troy. We wanted to reach the cars in time for the 8 o'clock train so as to go in company with Susan Phelps, who went on at that time to Washington. They sent for her to come and teach somewhere in that vicinity. We waited and went down a little past 11 o'clock and arrived about 1. Found Mr. Benedicts family well and waiting their dinner for us. Had a grand time, enjoyed the visit much. Called at Dr. Holmes and Mr. McDougals. Left at 8 o'clock Saturday A.M. and found Don and Rush waiting at the Depot. Came home by Columbia Flats and took dinner with Dr. Tracy. Saw Miss Carrie Tuttle there from Rochester. Got home a little after dark, tired and hungry. Henry Miner preached for us this morning from Ephesians 2, first clause of 21 verse. 'twas a beautiful discourse. Mr. Corss text in the afternoon was from 1 Peter 1, 24 and 25. Alanson, Mary Andrus, Rush and I went to Sunday School. Aug. 17 - Johnny left is this morning and we are very lonely indeed. He is a precious boy. More hard showers and now it is dark and gloomy. Mary Ellen is at Mr. Sumners and Rush off at school. Aug. 19 - Yesterday afternoon Mary, Rush and I met at Mr. Allen Califfs and stayed overnight. Mother and Don visited at Mr. Birds. Rush, Mary and I have letters ready to send to Johnny. We intend staying at Dr. Andrus tonight. Had a nice shower about 1 o'clock. Aug. 20 - Mary and I came home this afternoon. Aug. 21 - Stephen Califf visited here this afternoon and evening. Pretty cool weather. Aug. 22 - Received a long, interesting letter from Cousin Rezia Peck (?sp of name), who is now in Liverpool, England and has been traveling in Ireland and Scotland. Aunt Sallie got one from Mr. Buck. Don one from Lib Harvey and Rush one from Johnny Crowell, written on Wednesday last, the day he arrived home. Miss Adalaide Seely of Painted Post is here to stay overnight. Aug. 23 - Cold indeed for August. It seems very much like a snow storm. Heard Henry Miner preach this morning from John 3, 34 and Mr. Corss this afternoon from Is. 74, first clause of verse 9. H. Miner preached for the Baptist this afternoon. Attended South Sunday School, which is getting to be very interesting. See that the children improve in manners and are learning well. Mr. Marshall and John Bird called in this evening. Aug. 24 - Still quite cold--fear of frost. Mary took tea at Mr. Mitchells and gone to Emirs this evening with Alanson. Aug. 25 - Henry A. Miner here to dinner. Mary Ellen and I are going to stay with Rush at Mr. Harry Durfeys tonight. Weather getting warmer. Aug. 26 - Got home about noon. Found a letter from John Crowell. Mrs. Edward Child here to dinner. Been to take Mary Ellen to Mr. Birds--very pleasant evening. Aug. 27 - Thursday. A rainy day, which is much needed. Polly Durfey came from school with Rush to stay all night. Aug. 28 - Took the girls to school this morning, drove the colt alone for the first time. Father sold Kate to Mr. Muncy. Rush and Mary received letters from John and a piece to me. Aug. 29 - Saturday. Horace Niles and John Bird took dinner with us. Mary Ellen came from Mr. Birds this morning. Martha Phelps here tonight. Aug. 30 - Sunday. Mr. Corss preached from the last clause of the 18 verse of the 219 Psalm and from 2 Cor. 5, last clause of 20 verse. Mr. and Mrs. Dietrick were at church and had their little Franklin Pierce Baptised. Mr. and Mrs. Dietrick and G. G. Cole stay here tonight. Aug. 31 - Mother went with Mrs. Dietrick to Alansons this forenoon and to Emirs this afternoon. Paper read this evening--too tired to go. Sept. 1 - We were invited to Uncle Seldens this afternoon, but none went save Selden and I. Carried Mary Dietrick as far as there on her way to Williamsport. Sept. 2 - About 2 o'clock this afternoon Mr. and Mrs. Furber, she a niece of Mothers, came to stop a few days with us. They are from St. Paul, Minnesota and have been to New Hampshire. She was 49 last Aug., he is 69. Sept. 3 - Mother and I went with Mr. and Mrs. Furber to Emirs to dinner, then Father came and all but me went to Uncle Caldwells and from there to the Centre and home to tea. Sept. 4 - Mother went with them to Alansons to dinner. They, Caroline, Alanson, Emir and Ann and Johnny Bird here to tea. Sept. 5 - Another birthday. 32 years old. Don, Mother and Mary Andrus went to carry Mr. and Mrs. Furber to Waverly to take the Western train for home. Rained a little. Sept. 6 - Sunday. A pretty chilly day. Heard H. A. Miner preach in the morning from Acts 20, last clause of 35 verse and in the afternoon from 1 Tim. 1 to 15. A large congregation at Church. George L. Tracy of Poquomock, Conn. is to be married tomorrow morning and coming here on a bridal tour. Sept. 7 - Very cold. Quite a frost last night. Called at Dr. Andrus, John Phelps and Mr. Corss. Sept. 8 - Don and I have been to Waverly to change some wall paper which our folks got last Saturday. Received letters from Johnny. Sept. 9 - Been papering the parlor and bedroom. H. A. Miner and Clinton Califf called. Weather much milder. Sept. 10 - Commenced looking for George and wife. Sept. 11 - George and wife not come yet. Uncle Selden, Charlie, Jane and Sue came to call upon them and were here to tea. Jane stays till tomorrow night. Having a hard shower this evening. Saw a fire towards Athens presume some building struck with lightening. Sept. 12 - They arrived about 2 o'clock. Have been to Niagara Falls. George is taller than when I saw him in Conn., but his features are nearly the same. His wife is small, dark eyes, dark hair and light complexion--a pretty little woman. We had a brides loaf prepared in a pyramid form, which was on our tea table this afternoon. Charlie Martin and Jane Tracy here. Sept. 13 - Sunday night. The cousins attended Church with us. Henry Miner preached all day as Mr. Corss was absent. Text, James 1, last clause of verse 15. John Phelps asked us to his house to take lunch at noon which we did. Mary Andrus came home with us. Went to South Sunday School, which closed for the season. Promised my class--three in number--each a Bible when they have read the Bible through. Dr. Bullock and wife, Alanson, Chapin, Griffin and nearly all Uncle Bulkleys family were in this evening. Like George and his wife much. He looks and appears very much like Johnnie Crowell. Mrs. Willard Farnsworth died this morning. Sept. 14 - About 11 o'clock George and wife, Selden, Mary Rush and I went to Uncle Olmsteads; after dinner called a short time at Wms. and then went on to Uncle Selden's, where we stayed till in the evening. Met Sidney Hale there and Don brought Mary Andrus. Sept. 15 - George Nette, Aunt Sallie, Mary and I went to Uncle Bulkleys to dinner and then called a few minutes at Alansons. Came home to tea. Dr. Andrus and wife, John Phelps and wife, Hiram Carpenter and wife, Lucelia and Clara Phelps were here and in the evening Alanson, Chapin and four of Uncle Bulkleys children were in. Had a pleasant time. Sept. 16 - This morning Don and cousin Nette took a ride on horseback. Went and called on Rush's school. George, Aunt Sallie, Mary and I met them at the other place. Between four and five this afternoon, Selden, Mary and I started with them for Waverly. Got there after dark and took supper. Left them about 9 o'clock at the Waverly House, as they expect to take the cars East at 1 o'clock tomorrow morning. We bade them a reluctant farewell and got home at 12 precisely. We like our cousin very much indeed and have had a nice visit with them; are both 23 years of age. Every appearance of a storm and it will be acceptable as it is getting to be very dry. Mr. and Mrs. Peck of Bristol, Conn. came a year ago today. Sept. 17 - Quite rainy a part of the day. Aunt Sallie sick. Dr. Andrus came to see her. Mary Andrus stays tonight. Sept. 18 - Colder and some cloudy. Lark called this evening. Appearance of frost. Sept. 19 - Saturday. A very rainy day. Sept. 20 - Cold and some rain. Mr. Corss texts were Ephesians 6, 16 and 2, last clause of verse 3. Antionette Seeley came home with us from Church. Sept. 21 - Monday. The Bradford Co. Teacher's Institute, the second one since organized, sits in this place, commencing today to continue ten days. Don and Rush attend. Sept. 22 - Mary and I stayed last night at Mr. Mitchells. Another rainy day. Mary Andrus came home with the children from the Institute. Sept. 23 - Charlie Corss been here copying the Luminary. All went to hear Mr. Corss lecture this eve on Orthagraphy. Horace Niles came home with us. Sept. 24 - Took tea at Dr. Andrus, then went to the Institute. C. H. Phelps lectured upon Teachers preparing themselves thoroughly for their work. Weather cool but pleasant. Sept. 25 - Attended the Institute this evening. Mr. Corss, Prof. Croft and Mr. Foster spoke. Music, both vocal and instrumental. Sept. 26 - Went to Mr. Corss last night and stayed till this evening to copy the Luminary. Prof. Craft there. He and Charlie came and brought me home. Letter from G. L. Tracy. Sept. 27 - Sunday night. Heard Mr. Corss preached from Prov. 16, 9 and 119 Ps. 9 verse. Cool and very pleasant. Sept. 28 - Charlie Corss and Mary Andrus been here all day; He to assist in the Luminary. Mary to write a Valedictory for the closing of the Institute on Thursday evening. Read the paper this eve to a house full. Charlie is a grand reader and good composer. Sept. 29 - Stayed home to get ready to go tomorrow. Sept. 30 - Mary Selden and I went over to the Institute this morning and stayed all day. The afternoon was devoted to fun, so exercises were suspended and we all repaired to the grove, where a swing was prepared. Had speaking from several persons and a sentiment from Mr. Daily, the Superintendent of Chemung Co. 'twas this "The Ladies--May their virtues be as ample as the folds of their garments and their vices smaller than their bonnets". Mrs. Coburn came home with us tonight, Jane Tracy and P. Peck stayed here too. Oct. 1 - Went to the Institute again this afternoon. There was a general examination of teachers. Stayed at the shop till evening exercises commenced. Esq. Lyman addressed the Teachers as to their legal duties in school teaching. Remarks from Dr. Bullock, Mr. Corss, Rev. Thompson, and Prof. Coburn, Valedictory by Mary L. Andrus, a most delicate and beautiful production and read admirably. After this, C. H. Phelps in the name of the students presented a volume "Goodrichs Universal History" to Prof. Coburn. The parting song was sung and the Institute closed. It has been a rainy day. Oct. 2 - A very rainy day. Went to Preparatory lecture this afternoon. Mr. Corss preached from 119 Psalm 28 verse. Lemon called in a few minutes. Oct. 3 - Unpleasant weather. Horace Niles here this evening. Oct. 4 - Sunday. Mr. Corss text 27 Prov. 18 verse. Communion season in the afternoon. Oct. 5 - After working hard all day yesterday, walked to Dr. Andrus and back this morning. Pleasant again. Oct. 7 - Mary and Julien here to dinner. Aunt Sallie gone to stay at Mr. Harry Durfeys with Rush. Oct. 8 - Thursday--a beautiful day. Received the second letter from Cousin George and Nette. Mary at Mr. Niles and Mother at Dr. Andrus, is going to Troy with them tomorrow after Fannie Bailey. Oct. 9 - A pleasant day. Oct. 10 - Pleasant, went to the Centre this afternoon. Oct. 11 - Sunday, a beautiful day. Mr. Corss preached from the second clause of the 56 verse of Gen. 24 in the morning and in the afternoon Deuteronomy 32, 31. H. L. Niles here this evening. Oct. 12 - Dr. Dotty and Miss Parsons here to tea this afternoon. Clouded up and has every appearance of a storm. Oct. 13 - Governor's election--Wilmot and Packer candidate. Called at Mr. Carpenters and Uncle Gorhams this morning and Mary and I are now going to Dr. Andrus. Oct. 15 - Thursday. Got to the Dr's about noon, stayed till 2 o'clock then Mary took us over to Mr. Richard Kelleys. Commenced raining before we got there. The two Mary's stayed till night and went back, Rush and I stayed overnight. Wednesday Joanna and I went to Mr. Edwin French's to dinner and Mr. Durfeys to tea. In the evening went to a little party at Mrs. French's, which was got up for Rushs benefit, it being her last day of school. Don came for us in the evening. Selden went to Towanda to the Fair. Oct. 16 - Don has been to Towanda for Selden. Has rained most of the time since Tuesday P.M.
Oct. 17 - Saturday Mary Ellen came from the Drs. this morning. Johnny Bird and Cornelia Califf took tea here. A paper from Mr. Tracy Peck of Bristol, Conn. informs us of the death of his son Epayhroditus, which took place at Rundalls Hotel in London, Sept. 20. His sister is now alone. She went in June to visit him. He had resided in England some 15 years. Oct. 18 - Sunday. Stayed home, pleasant again. Alanson, Mary and Rush gone this eve to Elmira. Emir and Ann have just returned from the Falls and the N.Y. State fair at Buffalo. Oct. 19 - Pleasant and quite warm this morning, but grows cold. Oct. 20 - Found snow on the ground this morning. Wind blew hard all night and is yet at it. Commenced quilting a bed quilt for Aunt Susan. Oct. 21 - Mary Andrus came this morning and in the P.M. she, Don and I went to Jesse Sumners, met there, Mrs. Andrus, Mrs. Bailey, Mrs. Bullock, Mrs. Calliff, Laura Bird, Mary Ellen and Rush. A few of us called a while this evening at Mr. Calliffs. Mary Andrus came back with us. Oct. 22 - Don, Mary Ellen and Mary Andrus been to Waverly. Mrs. Andrus and Fannie came this morning. Dr. came up for Mrs. Andrus and was here to tea. Charlie Corss and Henry Phelps here also. Charlie and Fannie stay all night. Mrs. McClelland and little girl here to prayer meeting. Received a letter from Mr. Peck with a copy of Hezia's letters giving an account of her brothers sickness and death. Oct. 23 - Rains some. Mrs. Andrus, Fannie, and Mother been to Mr. Geroulds to dinner and Mary Andrus met them at Levis to tea. Oct. 24 - Saturday night. A cloudy, murky day. Don, Aunt Sally and I went to Dr. Andrus to tea. Mr. Bailey came there this morning. Oct. 25 - Sunday. Mr. Bailey preached for us today as Mr. Corss was absent. Texts Isaiah 55, 7 and 2 Peter 2, 9. Mr. Marshall came home with Don is quite sick with a pain in his side. Oct. 26 - A cold rainy day. Mr. Marshall too sick to leave. Father and Mother been this afternoon to Dr. Andrus. Charles Corss and I have expected to go to Towanda tomorrow, but the storm will prevent. Oct. 27 - Wind blows hard. Laura and John Bird and Horace Niles called. Charlie stays tonight. Think we shall to go Towanda tomorrow. Oct. 28 - Wednesday morning. We are going. Shall take Mr. Marshall to the Centre as we go along. Cold but doesn't rain. Sept. 16 - This day I have seen brother Selden united in the band of Matrimony with Miss Mary Louisa Andrus, second daughter of Dr. Daniel Andrus. About 1:00 P.M. the company assembled in the dining-room at Dr. Andrus and witnessed this marriage ceremony. The guests stood around the table when the prospective bride and groom came into the room, took their places at the head of the table and were married just before being seated for dinner. Rev. C. C. Corss officiated. Guests: John Phelps and wife, Lucelia Phelps, Bebee Gerould and wife, Alanson, Jane and Lois Tracy, Brainard Bowen and wife (Emmeline Tracy, Author of this diary, later became this man's second wife) Lark and Laura Bird, Mrs. Jane Pease, Cornelia Califf, all of our family and all of Dr. Andrus. 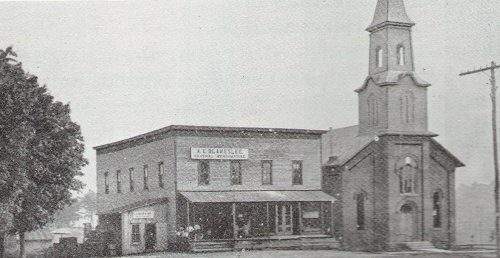 The same afternoon Don, Mary Ellen and Rush accompanied them to Waverly where they were to take the train that night for Sherburne, later go on to New Berlin, Cooperstown and then on to Mass. and Conn. and return by New York and Southern Penna. They will be some three or four weeks on the trip. Oct. 6 - Today Mary Ellen and I have been making cake preparatory to a party for Selden on his return from his bridal tour. A letter today says we may go to Troy for him next Thursday. Oct. 16 - Saturday Eve. We gave Selden and Mary a reception party. There were present beside our own family about 42 persons. Dr. Andrus and wife, Wayland, Collins, Euphemia and Sally Tracy of Uncle Olmstead's family, Caroline, Alanson, Chapin, Griffin and Helen of Uncle Orras family, Albert, Jane Harriett from Uncle Buckleys, Jane and Susan from Uncle Seldens, Perry from Uncle Gorhams. Besides there were Bebee Gerould and wife, John Phelps and wife, Lucelia, Clara, Susan, and Martha Phelps, Victoria and Diton Phelps, Lark, Laura and John Bird, Horace, and Nancy Niles, Clara Stockwell, Fredie Corss, Riton Durfey, Cornelia and Ellen Califf, Elbertine Sumner, Clayton and Jane Gerould. Our entertainment was: Bread and butter, cold chicken, coffee, tea, wedding cake, French loaf cake, Pound cake, common loaf cake, pear preserves, candy and sugar plums. Oct. 20 - Our whole family attended a double wedding in the Baptist Church at 10:00 A.M. Lark Bird was married to Nancy Niles by Elder Divire, and Horace Niles to Clarissa Phelps by Rev. C. C. Corss. Selden and Mary were the attendants of the first named and John and Lizzie Phelps of the second. The newly married couples left the church first, stepped into their carriages and started for Waverly on their way to the Falls. Not Dated - The lady teachers--Miss Fritcher, Miss Butler, Miss Stackwell and I went down to the river for a walk. In the afternoon Prof. McWilliam with all the teachers and many of the students went to see the closing exercises of the Institute, some of us were there on Wednesday evening. Emily Matthews read the Valedictory. On Thursday evening Mr. McWilliam gave a public party to the College, but being rainy only about sixty were present. On Friday Charlie and I took dinner at Mr. Coburns, then went back to the Friday afternoon exercises. After these were over Miss Butler and I called at Lawyer Morrows. By invitation the lady teachers Prof. Craft, Charlie and I were at Mr. Coburns for tea. In the evening we had a little party and an oyster supper in the College--supper in Mr. McWilliams room. Selden came for me and was at the party. Left town between 9 and 10 o'clock and got home near 2 this morning. Mary Ellen is at Mr. Birds helping get Johnny ready to go to Georgia where he intends to Winter. Nov. 1 - Sunday. My cold was too bad to attend church so stayed home. Rather pleasant but cold. Johnny and Horace called this evening. Nov. 2 - Cold and winds high. Jane and Charlie read their paper this evening, but my cold too bad to attend the reading. Nov. 3 - Henry Phelps stayed here last night. Charlie Corss been here today. Don gone to stay with Johnny Bird. Nov. 4 - Cold, disagreeable day. Mrs. Sumner and her two girls here this afternoon. Mary Andrus came to have us go to a surprise party to Mr. Birds this evening, given for Johnny who starts for Georgia tomorrow to stay through the winter. All went but me. David Newton's youngest child was buried today. Nov. 5 - Mary Ellen stayed to Mr. Birds last night. Charlie Gladding has a singing school this evening. Written to Hezia Peck who returned from Europe on the 20 last month in the steamer Europe. Ann Wood and Marion Child here all day. Nov. 6 - Mild and warm. Had a real spring rain. Charlie Corss called a while.